Nomadic peoples worldwide and throughout history have been faced with the problem of how to create cloth for their clothing, bags, tents, carpets, and other items. Thought had to be given to ease of use, portability, and the materials available to create the tools used for the unending creation of thread and cloth. The purpose of this class is to look at the time tested forms of nomadic and portable looms and apply these concepts to creating a loom appropriate for both the beginner weaver on a budget and the weaving aficionado who wishes to explore the engaging skills sets of warp and weft substation, brocading, and other period techniques. Variations of the ground loom, first depicted in ancient Egypt for linen production, are still in use in various forms from Central Asia through the Middle East and in Africa. This time tested loom design is extremely versatile and can be used to create fine linen up to cut pile carpets. The basics of this design are shared by the Backstrap loom which was found in period in South America but is also a traditional loom in Asia. The commonalities of these two designs give us the ability to create a warp and heddle system that can be moved from weaving on a ground loom outdoors to being woven as a backstrap loom while indoors by simply changing the method for tensioning the warp. This creates a loom which can be warped and taken to and from events, practices, and homes giving the weaver a lost cost loom to create a period style fabric. For the novice weaver this can represent a savings of hundreds of dollars by allowing them to try the craft without buying expensive loom equipment. The trade off is using patience and being willing to experiment since there are few opportunities to see these looms in use. The ground loom was first suspected to be in use in Catal Huyuk in Anatolia around 6000 B.C. but the ancient Egyptians depicted this type of loom in their pottery decorations, wall paintings, and funerary objects. 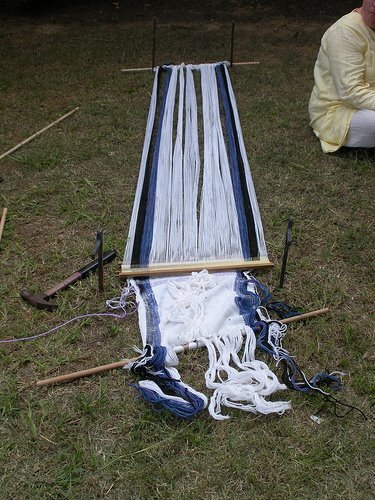 The ground loom is also called the two bar loom or the horizontal loom and can be used with or without a heddle bar. Scholars believe the first ground looms lacked heddles which would mean the weaver deftly picked the warp threads up with her fingers to insert the weft thread. As time went by the technological advance of the heddle bar was added allowing the process of weaving to be sped up and the easier creation of more complex weaving patterns such as the long hop twills found on the Tarim mummies of China. When either one heddle bar and a series of pick up sticks or multiple heddle bars are used the complexity of the fabric can be greatly embellished upon. The beauty of this simple loom is that it can be made simply with sticks and set up and torn down quickly and simply. The humble ground loom can be used to produce linens, silks, Persian rugs, kilims, yurt bands, saddlebags and tent fabric among other items. Varying the way the loom is warped enlarges the weaver’s ability to create intricate decorative designs. Also, when warping the loom there are two different ways found frequently. The nomads of the Middle East and the ancient Egyptians are often pictured weaving with the entirely of the warp spread out it’s whole length while many of the yurt band weavers of Kazahkstan, Kyrgystan, Karakalpakastan and the surrounding areas are pictured actually sitting on the warp which is a continuous loop that the simple move around as the need to advance arises. Both techniques seem to work equally well but with experience a weaver will decide which suits their needs. The basic parts of a ground loom are 4 stakes for the corners, three sticks several inches wider then the desired warp, and something to balance the heddle stick on such as a pair or rocks or boxes, and a shed stick. There are many ways to achieve this that will work. I have had success using 4 iron stakes such as tent stakes and dowel rods purchased at the local home improvement center. ends per inch= how many threads per inch of warp. You can place a ruler on a piece of fabric and count how many vertical threads are in an inch to give you your e.p.i. Check and make sure you have 1200 yards of yarn for the warp and roughly double that for the weft to make sure you have enough yarn for your project. Next choose the method of warping you would prefer. There are two methods. You can use a modern warping board which is a square or rectangle of pegs that you wrap the yarn around to reach the determined length or you can stake out three stakes or sharpened dowels outside and wrap your warp around them. Either method will work well although the warping board allows you to work inside and easily start and stop. The important aspect to both methods is called “the cross” and is the effect of the yarn going over/under/over/under etc around a peg/stake that is close to one of the ends. This will be demonstrated in class and illustrations and videos can also be readily found on the internet. After creating the “warp chain” take a contrasting color of string or yarn and distinctly wrap it around both sides of the cross so that it remains distinct when taken off the warping board or stakes. Also tie both ends of the warp with the contrasting string to keep it together till you arrange it on the dowel rods. Transfer your warp to the two dowel rods and stretch tightly between two sets of stakes. These two dowel rods are called the breast beam and the warp beam. The breast beam is the one closest to the weaver. At this point you will have the cross tied. You will want to take the third dowel rod and place it over the area of the cross. This rod is known as the heddle rod. Pull out an adequate amount of string with the understanding that it’s better to have too much then two little for the next step. This is where you will use string to create string heddles which wrap around the extra dowel rod. This continuous string attached to the heddle rod is the “leash”. This is used to create the “shed” which is in plain weave every other warp thread being raised or lowered so that you can insert the horizontal weft to create the cloth. When you pull up on the heddle bar it creates the shed and when you release it is called the counter shed. Take your string and create a slipknot and place it over one end of your heddle rod. The loop under every other string of the shed—first under the string then over the dowel—then repeat the process until you run out of warp threads and tie off the string on the heddle bar. It is very, very important that you choose the warp threads to lop under that are on the bottom of the cross. To find this you can place your shed stick on the other side of your cross—this will be demonstrated in class. Once this is accomplished you are ready to for the next step. A shuttle is a stick or piece of wood around which the yarn for the weft is wrapped then inserted through the shed of the warp. To begin the weaving take a thick yarn, strip of fabric, or even rolled up strips of paper around your shuttle or shuttle stick. Raise the heddle bar then insert the shuttle. Lower the heddle bar and insert the shuttle the opposite way through the counter shed. You can choose to use a fork or a sword beater to beat down each pass of the yarn. Weave about 2 inches then pick up a shuttle filled with your intended warp and begin weaving. As the cloth is woven you will find that you need to move up the warp as the weft advances. With the ground loom this can be accomplished one of three ways. You can place a stool or pillow under the warp and over the warp in the and actually sit on the warp, you can add another dowel rod and wrap the breast beam around it then scoot up the front stakes and retie the rod or as with the ancient Egyptian looms you can sit beside the loom and weave from the side although this is difficult. Modern Rigid Heddle looms are experiencing an upsurge in popularity at this time due to their ease and portability. A wooden bar with slots and sticks with holes in it allows the weaver to raise or lower the shed simply by raising or lower the rigid heddle then using the rigid heddle to beat the weft into place. This allows the weaver to skip the process of creating a heddle rod with a continuous string heddle and the use of a fork or a sword beater. Rigid heddles in a smaller form have been found within the SCA time period i are still in use in Northern Europe by the nomadic Sami people to create stunningly intricate woven belts and trim. If the weaver wishes to use the form of a ground loom but to avoid the process of a heddle bar a stand alone rigid heddle can be used. Repeat the process of figuring your warp and creating your warp chain but this time hold the cross in your left hand and thread each warp thread into either a slot or a hole of the rigid heddle. When you have pulled 6 or so threads thru the heddle tie a simple over hand knot to secure them. When you finish warping the heddle you will have a warp that you can then tie onto the warp beam or back dowel rod of your ground loom. Tie it to the back pair of stakes. Next take the warp in hand on the front of the rigid heddle and pull it towards you while using the rigid heddle to comb the warp. Tie your warp to evenly to the breast beam or front dowel rod and then put in the two front ground stakes and affix the dowel rod to them with string, yarn, or even reusable zip ties. This loom includes a tripod which is actually meant for a traditional ground loom and has no function in this photo. The intricate yurt band in the background is the type produced in Central Asia on ground looms. Tensioning is very important and if you find that some of your warp is not as tight as it should be you may either retie that section of warp on the warp beam or hang weights on the offending warp threads. On this loom you can see the rigid heddle in use instead of the traditional heddle rod. At my side is the sword beater that can be used to beat down the weft if I choose not to use the rigid heddle. Using eBay used rigid heddles can be purchased for as little at $10 or the weaver can choose to buy a new one for under $35. These heddles can be used within a frame at a later date or for a backstrap loom. Lady Lydia Leovic’s pictures of my Cheater’s ground loom. If you wish to continue working on your weaving inside or somewhere where you cannot pound in stakes but can tie off one in you can easily convert your ground loom into a Backstrap loom. According to Eric Broudy’s “The Book of Looms” the backstrap loom has many names and can be found not only in South and Central America but in China, Korea, Tibet, Burma, India, Malaysia, Indonesia, and northern Japan. Because the loom itself is made simply of sticks it would be impossible to determine if Central Asian nomads used it unless, like in South America, actually pieces of weaving were found intact on the loom. However, there is evidence in China dating from around 206 B.C. to 8 A. D. of its use in the form of bronze loom pieces (Broudy, p. 76) and it’s depictions on artifacts. To convert your recently made ground loom of either type simply take rope or card woven bands to use to make ties. On the warp beam you may make a slip knot and place it over one end of the rod, then measure off a length of your cord and make a knot in the center, then take an equal amount and make another knot to slip over the opposite end of the rod. Open you door and place the center knot on the other side of it then shut it firmly. I use the top of my door or tie the center knot around a door handle or even a small tree or fence post. You can also make the knot permanent and use a carbinger to attack to something secure. Next take another length of band or rope and repeat the process but leave out the central knot. You’ll be using your bottom or lower back to tension the loom so sit down comfortably and slip the first end of the cord onto the breast beam then around your body and then tie it off tightly on the opposite side of the beam. Now you have a basic backstrap loom and are ready to begin weaving. This setup is very versatile and can be used on your front porch, in your living room, or anywhere you can find somewhere to tension your warp. It is also possible, though not probable, that you can sit with your legs outstretched before you and tension the loom with your feet! Also you can create a hybrid loom by keeping the two back stakes of the ground loom while adopting the backstrap of the backstrap loom. Weaving as a craft is currently experiencing resurgence with the major loom and spinning companies such as Schacht, Kromski, and Beka cornering the market in producing small, portable looms aimed for both the beginner weaver and the more experienced weaver searching for something portable and inexpensive. 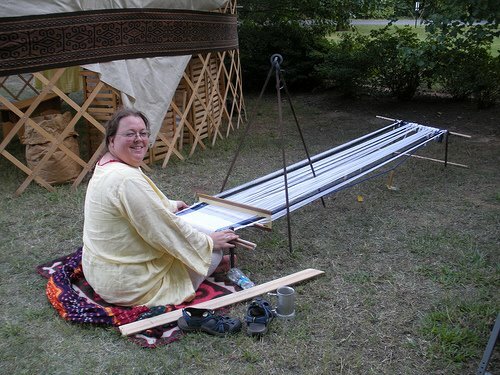 According to Vicountess Seelie, an archeological graduate student mundanely, the rigid heddle looms currently on the market are the closest to approximating the weave structure produced by the Warp Weighted loom. Rigid heddles looms, like the ground loom and backstrap loom, produce narrow width fabric which is appropriate for rectangle construction of tunics and dresses. Frame looms provide a simple method for weaving and can be made or purchased and set up with multiple heddle bars for the weaving of more complex fabrics. Schacht produces a frame loom that can hold up to four heddle bars for weaving twills but is actually proposed for weaving tapestry. The main draw back to these types of looms is that the length of warp produced is constrained to roughly double the length of the frame as it is warped in a continuous method and the warp is advanced by pulling the warp around the frame in relation to the heddle bars. Creating simple or complex fabrics to use for garb in the SCA can be an inexpensive and simple pursuit and a wonderful goal to help add authenticity to our game. Please think of the process of weaving your own fabric not in terms of how much time you spend on the project but the added value of actually experiencing and gaining a visceral understanding of the weaving process and creation of clothing which was such a massive part of our ancestors every day. Supplementary Weft Techniques. Minnesota: Dos Tejedoras, 1976. Barber, Elizabeth Wayland. Women’s Work: The First 20,000 Years. New York: W.W. Textile Techniques. New York: Schocken Books, 1976. Brown, Rachel. The Weaving, Spinning , and Dyeing Book. New York: Alfred A.
Burham, Dorothy K. Cut My Cote. Toroto: Royal Ontario Museum, 1973. Justin, Valerie Sharaf. Flat-woven Rugs of the World: Kilim, Soumak, and Brocading. New York: Van Nostrand Reinhold Company, 1980.
of the Earliest Peoples from the West. London: Thames & Hudson Ltd, 2000.